Snainton wrapped up their promotion as Derwent Valley League Division B champions with a 63-run home win against Wykeham 3rds. Michael Eyre yet again showed his class with 56 as the hosts limped to 138-6, George Shannon bagging 3-27. Leigh Watson then snapped up 4-37 to continue his fine form as Wykeham slumped to 75 all out, Robin Shepherdson hitting a plucky 29. Cayton 3rds need only 12 points from their final game of the season to secure promotion alongside Snainton after beating rivals Muston 2nds by 74 runs. Shakil Iqbal hit 47 as the hosts made 156-9, Jon Atkinson claiming 4-53 but 4-15 from Chris Pearson sent Muston crashing to 82 all out, Ray Roberts top scoring with 27. Valley Bar Nomads are still in the promotion hunt after earning a seven-wicket win at home to Thornton Dale 2nds..
Ben Atkinson hit 32 and Anosh George 57 as Nomads reached 127-3 after dismissing Dale for 123, M Allanson top scoring with 55 and Dave Parkinson taking three wickets, Tony Hulme bagging four. 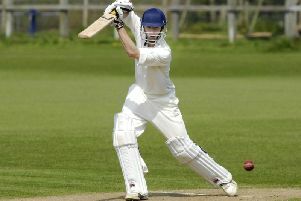 Scalby 3rds secured their first win of the season with a nine-wicket success at home to basement club Ravenscar 2nds. long-awaited win for the hosts. Kirkbymoorside need only 11 points from their final game to claim the Division A title after a massive 154-run win at Hospitals/Rugby Club. Jamie Harper led the way for Kirkby with 63, while Graham Jemison hammered 48, Andy Marley 46 and George Magson 33 as the away side racked up a massive 238-4. Hospitals slumped to 84 all out in reply, Bayes and Howard Mudd taking 3-6 and 3-11 respectively. Flixton 3rds maintained their outside chances of claiming the tirle with an eight-wicket win at Sherburn 2nds. John Sowden took 3-16 as Sherburn made 109-6, Kevin Stocks hitting 40 and Ashley Oldroyd 31. Old-stagers Pete Hill, 43, and Sowden, 33 sealed the win for the away team. Nawton Grange 2nds won by 75 runs at home to Forge Valley 3rds, the hosts sportingly lending four players to Valley who turned up with only seven players. Neil Ward hammered 78 as Grange made 176 all out, George Bentley adding 27 as Chris Calvert took 3-17 for the away side, who then were dismissed for 101. Kirkbymoorside 238-4 (Andy Marley 46. George Magson 33, Jamie Harper 63, Graham Jemison 48) beat *Hospitals/Rugby Club 84 all out (Andy Bayes 3-6, Howard Mudd 3-11) by 154 runs. Pts 20-2. *Nawton Grange 2nds 176 all out (Neil Ward 78, George Bentley 27, Chris Calvert 3-17) beat Forge Valley 3rds 101 all out by 75 runs. Pts 19-6. Flixton 3rds 111-2 (Pete Hill 43, John Sowden 33) beat *Sherburn 2nds 109-6 (Kevin Stocks 40, Ashley Olroyd 31, John Sowden 3-16) by 8 wkts. Pts 14-2. *Lockton beat Filey 2nds - Filey 2nds conceded. Pts 20- -10. *Cayton 3rds 156-9 (Shakil Iqbal 47, Jonathan Atkinson 4-53) beat Muston 2nds 82 all out (Ray Roberts 27, Chris Pearson 4-15) by 74 runs. Pts 18-4. *Scalby 3rds 83-1 (Grant Elwell 38no, Stan Jackson 32no) beat Ravenscar 2nds 82 all out (Nobeel Hussain 4-19) by 9 wkts. Pts 20-0. (Note - this was Scalby 3rds first win this season). *Valley Bar Nomads 127-3 (Ben Atkinson 32, Anosh George 57) beat Thornton Dale 2nds 123 all out (M Allanson 55, Dave Parkinson 3-37, Tony Hulme 4-38) by 7 wkts. Pts 17-2. No Game Today - Ganton 2nds.